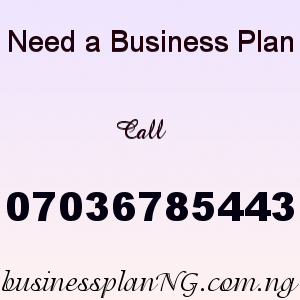 Writing a business plan in Nigeria is an important aspect for all business man or woman. To be successful in your line of business a well detailed business plan must be put together whether the business is about to start or its already running or you want to expand a good and detailed business plan will guide you and give you the insight you need to succeed in that business. As an entrepreneur a good and well written business plan is all you need to achieve your business goals. As we have earlier said in some of our previous post a business plan is a roadmap for your business. There are lots of benefit of business plan. It will not only guide you but can help you secure loans, grant and bring investors who would want to see your plans succeed. In writing a business plan in Nigeria or in any part of the world there some key or basic things you must do and that is to identify your niche and there is a difference between business plan and a business proposal. Its very important that you are certain about the kind of business you want to start or you have a comprehensive information about the business you are in already. The executive summary is the first page you meet after the page title, it is the general overview of business plan. In this page you would see the list of your business goals. his page should be written after the business plan is finished so when your business plan is well written you would automatically have a good executive summary. On this page, your company’s profile should be expressively described. This part is not too difficult because as the name implies it a full and complete description of your business. This is a full and complete explanation of what your company is all about, what it does, what make your company unique, what differentiate your business from others. Business description should contain current trends in market and your expectations for the future in regards to this trends. Its a page that should talk about the industry you are and its products and services and how it can be of an advantage or disadvantage to your business. This is a very important part of a business plan. It is a research of your market and the competitors in your line of business. This aspect of a business plan gives you what to expect in the industry. When this is done properly you would become familiar with the industry and this will make it very easy for you to plot your success graph. This part might not be so easy especially when yo are new in writing a business plan but you can seek the services of market research firms to assist you. In this page of a business plan, you would provide information about your product design and development plan and strategy of the business. This is page should contain strategies you intend to use to reach your business goals. This part of your business plan talks about how your business structure is going to be like, the kind of organization you would use for your business. It important to use the right organization and management structure that works for you. You must not necessary copy others because your goals might not be the same, so having your own unique structure could put your business where you would want it to be. In this part of your business plan, you’d outline the product line, your product’s market research, the product development process and strategy, the services you offer and the reason for the product. You would describe how your customer would benefit from your product, the price of your products should also be listed. From the information you have gotten from your market research and analysis, this page should talk about you intend to reach your target customers and market your product. You marketing strategies and promotional tactics should also be outlined. This part is about your financial needs, if the reason for your business plan is to raise funding include the total amount you will need for the business. To get a bank loan or a grant through a business plan require you to be very detailed and clear in best possible way. It is very important to note that your financial projections has to be very clear and detailed most especially when you require a bank loan or a grant. Get all the information you need regarding your financial forecast and be very precise, no assumptions or exaggerations.